From the pages of The Economist. 1. A New Giant Lizard. ” This week Biology Letters, one of the journals of the venerable Royal Society of which both Wallace and Darwin were fellows, describes something novel from northern Luzon, in the Philippines, that is large, showy and also slightly strange. 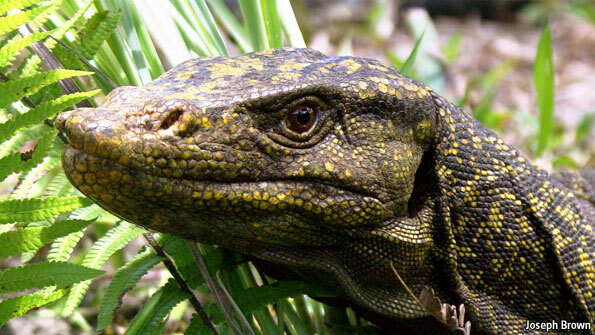 It is a monitor lizard as long as a man is tall, which is a close relative of the notoriously carnivorous Komodo dragon, yet which is, itself, vegetarian.” I think it is cute. No one else in my family is into this kind of stuff. When in Orlando a few weeks ago we could have gotten free passes to Gator City. No takers. 2. Shelling Out. I have no idea why a story about cross breeding oysters would fascinate me. I like lite science. Always have. This one caught my fancy. (Do people say “caught my fancy” anymore? What would the texting for that be.) Here is an except from the story. “As many gardeners and farmers know, crossbreeding two wimpy specimens sometimes produces strong offspring—an effect known as hybrid vigour. Hybrid vigour is common in plants and is found in some animals—though, some speculate, it may be lacking in European royalty. Several years ago Dennis Hedgecock of the University of Southern California and his colleagues discovered that oysters can hybridise. If a tiny inbred strain called “oyster 6” is bred with the similarly puny “oyster 7”, the result is a large and fast-growing oyster—“oyster 6×7”—which is easy to open and produces tens of millions of eggs. The problem, though, is that when oyster 6×7 is bred with itself, the resulting offspring are puny again. The hybrid does not, in the jargon, breed true. If new hybrids were easy to generate in quantity, that would not matter. But oysters 6 and 7 themselves produce only around a million eggs per adult, and their shells are hard to open. Oyster farms each need tens of billions of eggs to operate commercially. Constantly regenerating the hybrid is not a viable approach. Cross bred oysters with a little horseradish. Yum.